A tank car model with components from Tichy and Athearn reflects a popular prototype. Here are a couple more modified models that are in service on the railroad. 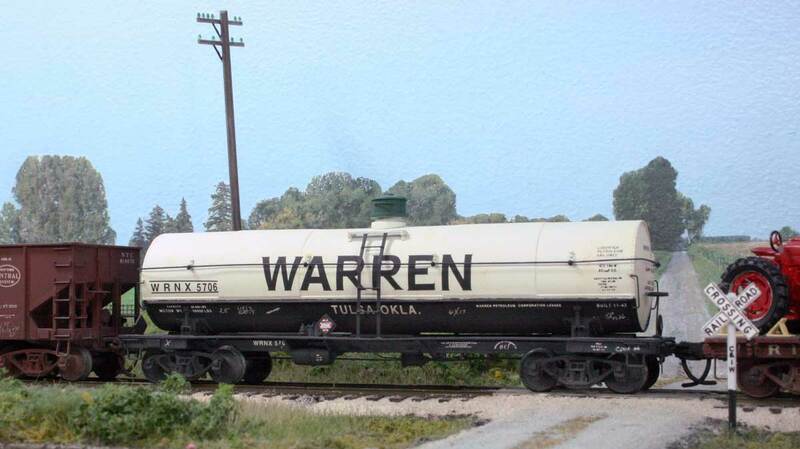 The Warren tank car is a shortened Athearn chemical tank on a lengthened Tichy frame. The cuts in the Athearn tank are covered with 0.005-inch sheet styrene to represent the jacket over the insulation. The model has the rough overall dimensions of an AC&F Type 27 Class 105 propane 10.5K gallon tank car. The bonnet is a resin casting that I did maybe two decades ago and has been noted several times on Tony Thompson’s blog. The decals are from Sunshine Models but others are available. 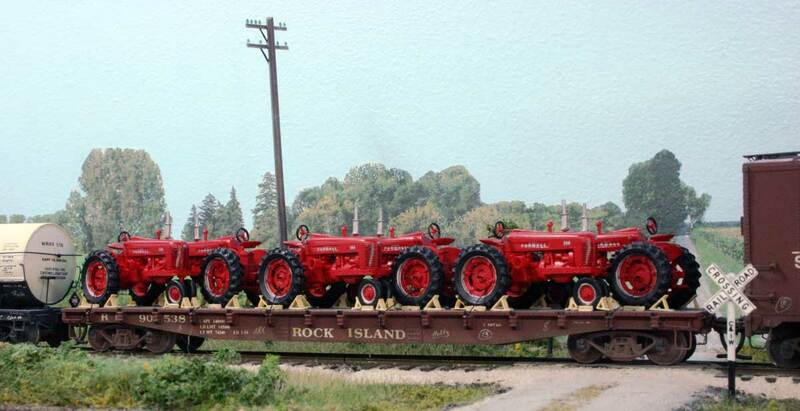 This flat car is actually two Red Caboose flat car models spliced together just as the Rock Island had done. Take a flat car, cut it in half, add new steel in-between and “presto!,” a longer flat car. The splice plates were done with styrene with rivets harvested from an Athearn gondola. Today we would use Archer rivet decals. The decal lettering were extra bits from other used sets. The deck was widened with styrene matching the existing deck thickness and then distressed. The stake pockets came with the Red Caboose kits. The load is six Farmall 300 series tractors which were produced from 1954 to 1956, which falls right into my late August 1955 time period. These tractors are resin castings from a pattern done for Martin Lofton at Sunshine Models, but were never issued. A recent discussion on the Steam Era Freight Car YahooGroup centered on an interesting Waterloo, Cedar Falls & Northern (WCF&N) flat car. Here’s one way to model a similar prototype.